This is one of the most comprehensive and interesting biographies I have read, and I have read many. The second and far less important reason, is a more tactile and visual one. The book was published by Anchor Press, Doubleday, USA and printed in 1988. A few pages had not been cut through along the bottom of the book, and the bottom edges of all the pages were so rough, they looked as though they had been cut with a chain saw. Normally I wouldn’t have bought such a book, but I spotted it at a book fair and was afraid I might not find another copy. I am surprised this edition was ever released for sale. The previous owner either didn’t bother to read the book at all or just read the accessible pages;either way they missed out on an exceptional biography! However, I am happy to say that once I began reading about Ezra Pound, I soon forgot about the physical aspects of the book itself. 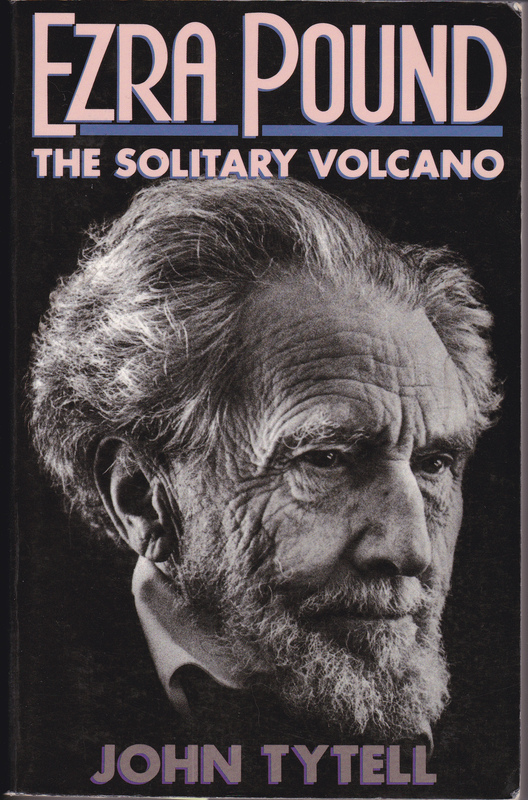 Ezra Pound is generally considered the poet most responsible for defining and promoting a modernist aesthetic in poetry. In the early teens of the twentieth century, he opened a seminal exchange of work and ideas between British and American writers, and was famous for the generosity with which he advanced the work of major contemporaries. Pound admired Impressionist painters for their taking art out of the ‘dark ages’ and into the light of realism and he did the same for poetry. He believed earlier British poetry was stuffy and concentrated too much on set verses and rhyming. His mental energy was legendary and he left behind thousands of letters, a prolific amount of works including poems, prose and translations. Ezra Pound was a profoundly complicated man who didn’t listen easily to those whose opinions differed from his own; he could be very dogmatic and nasty, especially about political issues. He ranted and wrote throughout his adult life about his hatred of usury, Jews, banks, American politicians (especially Roosevelt) and America itself. Pound’s vitriolic attacks against his own country began when as a student he alienated himself from the American university community with his strong political views and his sometimes outrageous behaviours. Later, he reveled in his powerful erudition and used it to discredit his country and its leaders. He didn’t think much better of the British, informing Bertrand Russell that he was glad “you know your lousy country has paralysis” and wrote that the British Parliament was a collection of ‘six hundred apes’, and British universities were full of “hired pimps”. During WW2, Pound relayed fascist propaganda across Italy’s radio waves, and openly wished that American and British politicians had the intelligence of his friend Mussolini (‘old Mussy’), whom he met only once and who actually believed Pound to be a nutcase. Pound was convinced that because of Britain’s stupidity, Hitler and Mussolini were going to win the war. He was incensed that America would even consider entering the war. His reasoning for this might find favour with some readers. That Pound’s friends and contemporaries were in awe of his works, and their sheer volume, there is no doubt. Apart from his poetry, prose and cantos, he translated Chinese and Japanese works into English, studied and translated Confucius (he believed Confucius to be infallible) and spent his early years in Paris and Italy supporting fellow poets and writers and promoting their works. Pound neglected his own work at times to find benefactors and publishers for his contemporaries such as James Joyce, WB Yeats, TS Eliot, and Marianne Moore, to name but a few. Not surprisingly, followers were well aware of Pound’s mercurial moods. It can’t have been easy listening to his long hateful diatribes on anything from anti-Semitism to miscegenation to Western economics. He could also be very insulting about his friends’ friends and relatives. Even his letters to his friends and acquaintances consisted of pages of his views on what was wrong with America and Britain. He didn’t think twice about writing to men in positions of power to offer advice on how their country should be run. Pound’s friends, fellow writers and poets nevertheless were loyal and were always there whenever he needed help, especially as he aged. Pound could be very entertaining when he chose to be, and people would sit for hours listening to his recitations. He received hundreds of letters from young poets and writers and ordinary citizens, addressed with such titles as ‘Dear Fatigued Prophet’. In the last months of his life (he died in 1972 on his 87th birthday) he suffered from depression, and barely spoke. He was full of regret for the way he had neglected his children; a daughter by his lover Olga Rudge, who as an infant, was placed in the care of peasant farmers; and a son by his wife, Dorothy Shakespear. Their son lived with Dorothy’s mother almost from birth and scarcely knew his father. Dorothy ‘understood’ that Pound’s numerous affairs with other women were a part of his ‘romantic, artistic nature’. Pound was also regretful about his strong political views and his public support of fascism and what it cost him: incarceration in a cage with iron bars for months, guarded by American soldiers in Italy, until he could be taken to America to be tried for treason. While in the cage, Pound suffered a complete mental breakdown and was never again the strong physical and mentally robust person he once was. Upon arrival back in America psychiatrists assessed that Pound was insane and should not be imprisoned, so he was transferred to an asylum. He had his own room at the asylum and ran it like a Paris salon with all his books and papers on shelves around him. Poets, writers and followers visited him often under the watchful and caring eyes of his faithful wife, Dorothy. It’s a testament to the respect fellow literati had for Pound in the way they rallied to have him released from the asylum. It’s interesting to read how for months they pressured powerful figures in America to have Pound’s indictment on treason charges dropped so he could be freed. Two of his psychiatrists at the asylum were also in sympathy with Pound and had ensured that their weekly assessments of his mental condition would keep him from being transferred back to a high security prison and subsequent trial. Though all agreed that they would ‘hate to see Ezra die ignominiously in that wretched place where he is for a crime which if proven couldn’t have kept him all these years in prison’, they were also realistic… ‘neither you nor I would want to take him into our family or even into our neighbourhood’. He was finally released from the asylum after spending over twelve years there. Soon after his release was finally secured, Pound set sail for Naples, declaring upon his arrival to assembled journalists “All America is an insane asylum!’. His friends were dismayed at Pound’s fascist salute and his ‘refusal to submit to forces more powerful than any single man’. Pound outlived his friends Ford Madox Ford, Ernest Hemingway, Wyndham Lewis, TS Eliot, EE Cummings, WB Yeats, and William Carlos Williams. He died a semi recluse in Venice in the care of Olga, his mistress; his wife Dorothy was by then living in the UK with their son, Omar.